Knoco stories: Which Knowledge Management Processes add most value? Which Knowledge Management Processes add most value? I blogged yesterday about usage and value of Knowledge Management technologies. Here is a similar analysis, also drawn from our 2017 Global Survey of Knowledge management, of the usage and value of KM processes. The chart above shows these processes in order of value from left to right, as a stacked area chart of responses, with the weighted value of the process overlain as a line (this line would be at 100% if all the participants that used this process claimed it had "high value" and at 0% if they all claimed it had no value). The height of the dark grey area represents usage, as the light grey area is the "Not Used" response. 288 people answered this question on the survey. from a wide range of organisations around the globe. The processes are also listed below in order of the usage figures, and in order of the average value assigned by the respondents. As with the Technology results, there is a strong correlation between usage and value. This could represent a tendency for the more valuable KM processes to get the greatest use. This is a perfectly valid interpretation. An alternative argument would be to say that processes deliver more value the more they are used. Processes at the top of the list are mainstream processes, used frequently, and delivering high value. Processes at the bottom of the list are less mainstream, and deliver less value to the companies that use them, because those companies make less use of these processes. This is also a plausible interpretation. Even with this interpretation, we could still look for "Good performing" processes which deliver more value than their popularity would imply (and so are significantly higher in the value list than in the popularity list), and "Poor performing processes" which deliver less value than their popularity would imply. 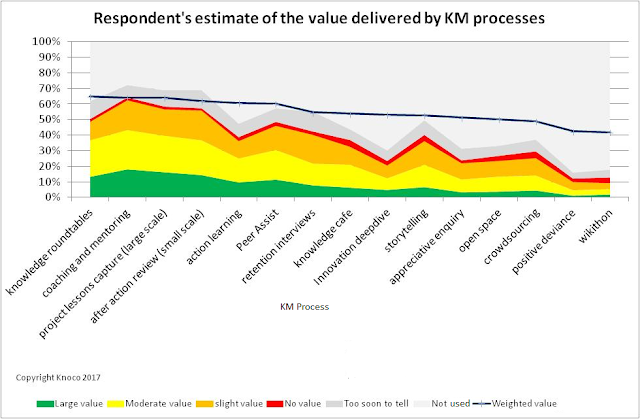 Under this interpretation, the best performing KM processes are Innovation Deepdive, Knowledge Roundtable meetings and Action Learning (both of them 3 or 4 places higher in the Value list than the Usage list) and the poorest performing processes in terms of value per use are Crowdsourcing and Storytelling. We saw similar results in the 2014 survey, with processes such as Knowledge Roundtable, After Action Review and Coaching and Mentoring both popular and performing well. However there are also some significant changes in both usage and value. Those processes which have seen the greatest increase in use between the two surveys in 2014 and 2017 is Project Lesson Capture, with a rise in usage of 5 places and in value of 6 places, and Storytelling (+7 in usage, +4 in value). It looks like the old staples processes of KM - the knowledge roundtable meetings, after action reviews, lesosn capture, peer assist and coaching and mentoring - remain the core process set for Knowledge Management.